The map showing tree canopy percentage was a big draw. Too often the first inkling of construction in our neighborhoods is the day the trees come down — but could this be prevented by education to the construction companies and residents planning to remodel or build a new house? TreeStewards and the Arlington County Urban Forestry Commission tested this theory on March 8, 2014 at the Arlington Home Show. 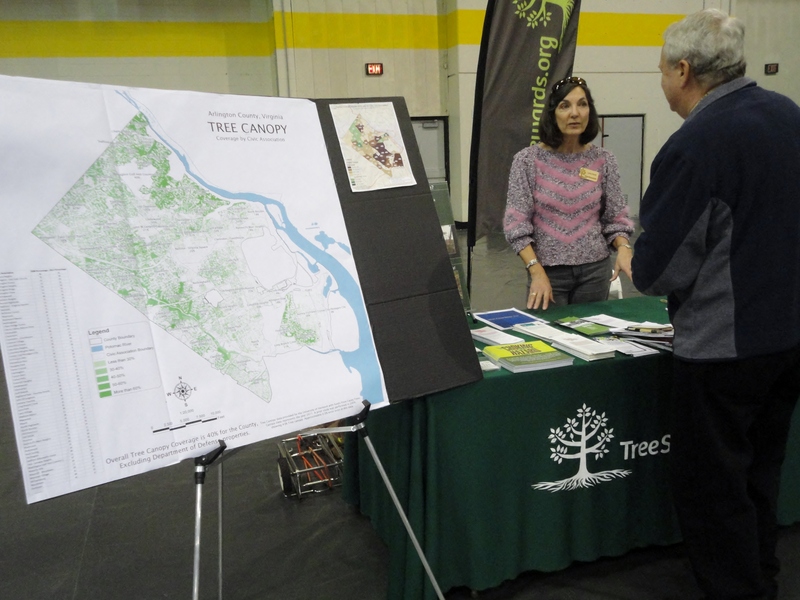 The information booth featured a large map divided into civic association areas with the tree canopy percentage shown for each so residents could compare theirs to the county average of 41%, and a sign advertising the Tree Canopy Fund. The response was great! Over 150 individuals had conversations with those staffing the booth and many more picked up tree care materials. We answered questions on best time to plant trees, how to select an arborist, and especially ways to prevent tree damage during construction. Outreach to other exhibitors was also accomplished by TreeSteward John Wingard who visited vendors who often impact trees: landscapers, hardscape designers, deck builders, addition builders, remodelers and realty companies. The brochures Avoiding Tree Damage During Construction and Treatment of Trees Damaged by Construction were provided. Builders who did larger projects of multiple houses were also engaged in a discussion of county permitting procedures that might provide flexibility in preserving trees and contacts were made for future discussions. Finding ways to preserve trees in the midst of a building boom is challenging but necessary. We don’t know the final impact of our education at the Home Show, but we successfully reached an audience that does have ongoing impacts on trees. If you’d like to join the small group studying ways to reform permitting and zoning, plant a seed in our comment box farther down to the right. This entry was posted in Advocacy, Community Service, Events and tagged construction, home show. Bookmark the permalink.